Announcement Fun, colorful mosaics and mosaic supplies. New, upcycled, and reclaimed materials. The mosaic supplies are leftovers from my projects and great finds I am passing along. Supplies are limited. Contact me with any questions! Fun, colorful mosaics and mosaic supplies. New, upcycled, and reclaimed materials. The mosaic supplies are leftovers from my projects and great finds I am passing along. Supplies are limited. Contact me with any questions! Mosaicked brown sand ring dish, trinket tray, creative reuse. As always, it's a sincere pleasure to receive your gorgeous tiles! Again, perfect service & price--Thank you so very kindly!! These tiles are so yummy & gorgeous! Perfect service & price--Thank you so very kindly!! Rec'd tiles today. Thank you for quick shipping on these. Merry Christmas! This window hung above the door of a 100 year old building that was being renovated. It was headed for the dumpster. This is the window refinished, repainted, and mosaicked with my original design and hanging in the renovated offices. I found this table was set out with the trash. For years, I used it with a table cloth over it. 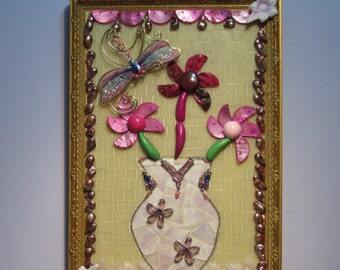 This was one of the first pieces I reclaimed when I started making mosaics. ReclaimedMosaics was born out of owner, Dawn Briskey's, passion about making mosaics, especially out of found objects. She took her first mosaic class at the Chicago Mosaic School in 2009. Not long after, she started to see objects to be mosaicked all around her neighborhood. An old piano bench at the end of the alley, a discarded box of stained glass scraps, an old bowling ball, wooden windows and more have showed up in her life, as if crying out to be rescued through mosaics. Before long, Dawn's garage and basement were spilling over with these items. In 2013, she began to sell her work, to make room for new pieces, and to share her art with a broader community. Learn more about the art creation process at reclaimedmosaics.com. While there, be sure to sign up for the ReclaimedMosaics newsletter to stay informed of new offerings and updates. I have always enjoyed making things. With mosaics, I bring two of my passions together: the joy of creating new objects and the fun of finding discarded objects at thrift shops, estate sales, and in the neighborhood. I live and work in Chicago. Welcome to ReclaimedMosaics. My mosaics are made with a combination of discarded and brand new materials to create a unique look. Thanks for taking the time to look at what I have created, and feel free to contact me with any questions. I want you to be satisfied with what you have received. If you need to return an item I will generally ask that you pack it in the same manner in which it was sent to you and return it to me within fourteen days of receipt. If it is returned in excellent condition I will issue a full refund for the cost of the item. Shipping costs are non-refundable, unless the item has been damaged on its way to you. In the event you receive something in less than perfect condition, please contact me immediately. I accept Visa, MasterCard, American Express, Discover and Etsy gift cards. You can also complete your transaction through PayPal. The sale will be considered final upon receipt of payment. If you are an Illinois resident, sales tax will be added to your purchase. I ship via USPS and UPS. I will always look for the least expensive way to ship an item. If you purchase several items at the same time, I will ship them together if possible. I will refund any overcharges exceeding 10% of the total shipping costs. Shipments will be insured for the value, and when possible, I will provide tracking information. Unless otherwise noted, my mosaics are not suitable for outdoor display. Do not immerse the mosaic in water at anytime. If you have any questions at any time about how to best care for your purchase, do not hesitate to contact me.